When you've got a property to let you'll want to find a suitable tenant as soon as possible to avoid losing out on several rounds of rent. Unfortunately, if word gets out that your property is less than desirable it may be weeks or even months before a potential tenant is willing to even look at it. To avoid this sad scenario, entice tenants with an amazing ad and perfectly prepped rental property. Before you know it you might be overrun with offers! Whether you are running a private listing or working with an estate agent, make sure that any advertisements for your rental property are clear and concise. Remember, potential tenants don't want to waste your time or theirs and vague ads are terrible for trying to decide if they should view a property. 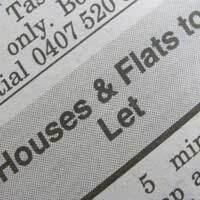 If you are writing your own ads for a property to let, avoid simply listing viewing times and instead give a brief summary of the property (even as something as simple as "two bedroom, one bath apartment with city views and working fireplace" can help entice tenants). Also be sure to include the date the property will be ready for new tenants, the expected rent per week or month and contact information so that a prospective tenant can get in touch to ask questions or set up an appointment to view the rental property. Any expected security deposits that are to be paid up front should also be included, and if you are only holding open viewings at particular times, make this clear in the ad. If you are working with an estate agent to advertise your property to let, make sure that you both agree on an honest and clear ad for the property and a few flattering photos. These pictures will be especially important if the property is being listed online, as prospective tenants have come to expect such things when browsing the listings. Also, regardless of whether the advertising will be in print or online, produced by you or your estate agent, be very clear about the type of tenants you are anticipating. If it is a property meant for students just say so, but if you are only considering young professionals or families, make this clear too. Again, the more specific the ad the less time wasted by enquiries that will ultimately go nowhere. Once you've got your property advertised, begin to prepare it for viewing by potential tenants. To begin with, make it look as big as possible. Light coloured walls, plenty of sunshine (or even artificial light) and clean floors all go a long way towards "opening up" a room, even if it is fairly small or has low ceilings. Cleaning out clutter, removing unnecessary furniture and taking away unneeded ornaments will also help make rooms look larger. In fact, if you are renting a full furnished property, be sure to only show the furniture that is included in the rental price during viewings. Do not add extras to make the rental property look more homely only to later take them away before a tenant moves in. If you want to make a property to let seem more welcoming, consider simply burning scented candles before a viewing or pulling the old seller's trick of baking some bread of cookies prior to a viewing and making sure the scent wafts around all the rooms. Of course, all of these tricks will be useless if the property is not in good shape. Before showing it to potential tenants, make sure that all unsightly blemishes (holes in walls, soiled carpets, etc.) are fixed and all plumbing, heating and electrical systems, as well as large appliances, are in good working order. Enticing tenants to your rental property should not be a hard task, but getting them to sign on the dotted line will require proper preparation. Put in the time now to show your property off to its fullest, and you'll be glad you did later.